Peach Cobblers are an American deep-dish fruit dessert or pie with a thick crust (usually a biscuit crust) and peach filling. Peach Cobbler day was created by the Georgia Peach Council in the 1950’s to sell canned peaches. The rough look of the pie gives the dish its name. It looks “cobbled” together. There are 419 calories in 1 cup of Peach Cobbler. 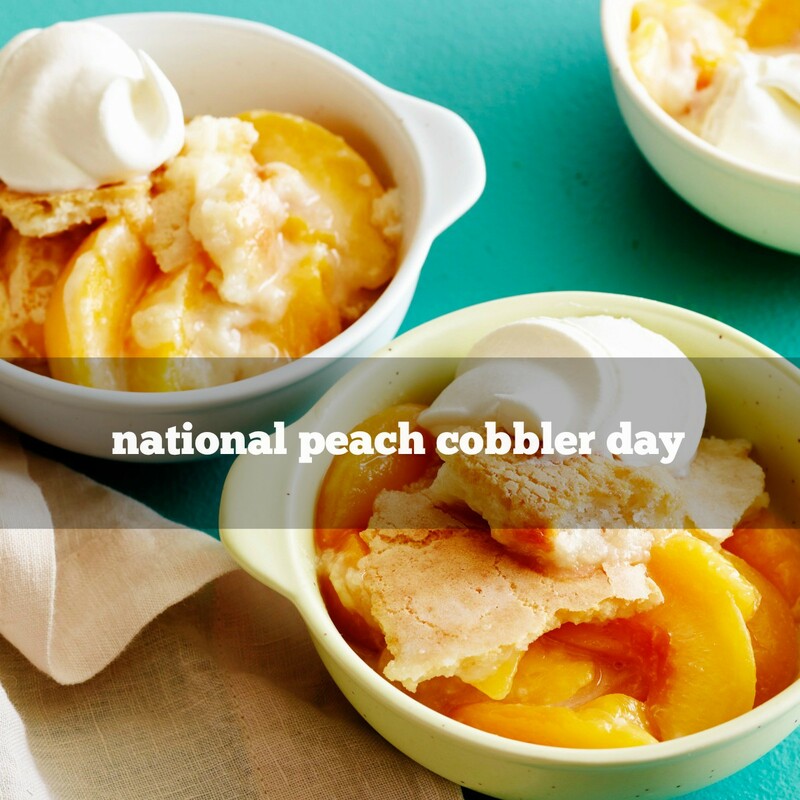 Peach cobbler was invented by early American settlers. The “World’s Largest Peach Cobbler” can be seen and tasted at the annual Georgia Peach Festival. This huge dish is 11 by five feet (about three by two meters) and eight inches (about 20 centimeters) deep. The recipe requires 75 gallons (285 liters) of local peaches, 90 pounds of real butter, 32 gallons (about 122 liters) of whole milk, 150 pounds of wheat flour, and 150 pounds of sugar. Some versions of Peach Cobbler are enclosed in the crust, while others have a drop-biscuit or crumb topping. 1748 Joseph Bramah was born. An English engineer, among his many inventions was a beer engine, used to deliver beer from keg to glass without artificial carbonation being added. 1883 Alfred Packer was convicted of cannibalism in Colorado. (Actually he was convicted of murder, since cannibalism was not against the law). He was sentenced to death, but was retried in 1886 and sentenced to 40 years. He was paroled in 1901, and died in 1907. 1902 Baron Philippe de Rothschild was born. (Wine producer). 1909 Mervyn Hugh Cowie was born. Cowie was a British wildlife conservationist, founder and director of Kenya’s Royal National Parks. 1916 Edna Lewis was born, southern chef and author of ‘The Taste of Southern Cooking’ (1976). 1917 James Buchanan (‘Diamond Jim’) Brady died. An American financier and philanthropist, Diamond Jim was known for his diamond jewelry and his huge appetite. 1944 Jack Casady of the music group ‘Hot Tuna’ was born. 1976 The $2 bill is reintroduced by the U.S. Treasury. 2008 The National Meats Institute in Uruguay organized a record Largest BBQ, grilling about over 26,000 pounds of beef on a mile long bbq grill using 6 tonnes of charcoal.